The IRS Audit Process "
The IRS Audit Process is important to understand, if you’re the unlucky chosen one. That said, the Internal Revenue Service (IRS) accepts most federal returns as filed. Some returns, however, are examined, or audited, to determine if income, expenses, and credits are reported accurately. This article discusses general rules and procedures they follow in examinations. It explains what happens before, during, and after an examination. It also explains appeal and payment procedures. As a taxpayer, you have the right to fair, professional, prompt, and courteous service from IRS employees, as outlined In the Declaration of Taxpayer Rights found on page 3. You are identifying a mathematical or processing error they made.You must request reconsideration in writing and submit it to your local IRS office. 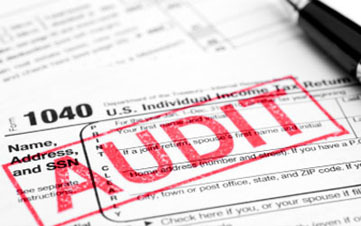 What To Do If You Agree or Disagree with the IRS Audit Results? If you agree with a proposed Increase to tax, you can sign an agreement form and pay any additional tax you may owe. You must pay interest and applicable penalties on any additional balance due. If you pay when you sign the agreement, interest is generally figured from the due date of your return to the date of your payment.If you do not pay the additional tax and interest, you will receive a bill If the amount due (including interest and applicable penalties) is less than $100,000 and you pay it within 21 business days, they will not charge more interest or penalties. If the amount is $100,000 or more, the period is reduced to 1O calendar days. If you can’t pay the tax due at the end of the examination, you may pay whatever amount you can and request an installment agreement for the balance.If you are entitled to a refund, you will receive it sooner if you sign the agreement form at the end of the examination. You will also be paid interest on the refund. An agreement or a waiver form. You generally have 30 days from the date of the 30-day letter to tell us whether you will accept the proposed changes or appeal them. The letter will explain what steps you should take, depending on what action you choose. Be sure to follow the instructions carefully. Appeal rights are explained following this section.If you do not respond to the 30-day letter, or if you respond but do not reach an agreement with an appeals officer, they will send you a 90-day letter, also known as a Notice of Deficiency. This is a legal document that explains the proposed changes and the amount of the proposed tax increase. You will have 90 days (150 days if it is addressed to you outside the United States) from the date of this notice to file a petition with the Tax Court. If you do not petition the Tax Court you will receive a bill for the amount due.Fast Track Mediation ServicesIf you do not agree with any or all of the IRS findings, you may request Fast Track Mediation services to help you resolve disputes resulting from the examination (audits). Fast Track Mediation offers an expedited process with a trained mediator, who will help facilitate communication, in a neutral setting. Most cases qualify for Fast Track Mediation. To begin the process, you may request the examiner or IRS representative to arrange a mediation meeting. Both you and the IRS representative must sign a simple Agreement to Mediate form. A mediator will then be assigned. Generally, within a week, the mediator will contact you and the IRS representative to schedule a meeting. After a brief explanation of the process, the mediator will discuss with you when and where to hold the mediation session. Act on your own behalf. (In the case of a jointly filed return, either spouse or both can attend the Interview.) If you are acting on your own behalf, you may leave to consult with your representative. IRS will suspend the Interview and reschedule the examination. IRS cannot suspend the interview if they are conducting it as a result of your receiving an administrative summons. Have someone accompany you, either to support your position or to witness to the proceedings. Accompany someone who will represent you. This person must be an attorney, certified public accountant, enrolled agent, an enrolled actuary, or the person who prepared the return and signed it as the preparer. Have your representative ad for you and not be present at the audit yourself. If you choose to have someone represent you in your absence, you must furnish us with written authorization. Make this authorization on Form 2848, Power of Attorney and Declaration of Representative. During your examination, if you think you will owe additional tax at the end of the examination, you can stop interest from accumulating by paying all or part of the amount you think you will owe. Interest will stop accumulating on the part you pay when the IRS receives your money. Interest will only be charged on the tax, penalties, and interest that are unpaid on the date they are assessed. The IRS tries to examine tax returns as soon as possible after they are filed, but occasionally they may request that you extend the statute of limitations of your tax return.A return’s statute of limitation generally limits the time they have to examine it and assess tax. Assessments of tax must be made within 3 years after a return is due or filed, whichever is later. They can’t assess additional tax or make a refund or credit (unless you filed a timely claim) after the statute of limitations has expired. Also, if you disagree with the results of the examination, you can’t appeal the items you disagree with unless sufficient time remains on the statute. Because of these restrictions, if there isn’t much time remaining to examine your return, assess additional taxes, and/or exercise your appeal rights, you have the opportunity to extend the statute of limitations. This will allow you additional time to provide further documentation to support your position, request an appeal if you do not agree with our findings, or to claim a tax refund or credit. It also allows the Service time to complete the examination, make any additional assessment, if necessary, and provide sufficient time for processing.A written agreement between you and the Service to extend the statutory period of a tax return is called a “Consents to Extend the Statute of Limitations”. Consents can be used for all types of tax except estate tax.There are two basic kinds of consent forms. One sets a specific expiration date for the extension, and the other for an indefinite period. If the statute of limitations for your tax return is approaching, you may be asked to sign a consent. Limit the extension to a particular period of time. The consent will be sent or presented to you with a letter explaining this process and Publication 1036, extending the Tax Assessment Period. For further information, refer to this publication. Results of the IRS AuditIf they accept your return as filed, you will receive a letter stating that the examiner proposed no changes to your return. You should keep this letter with your tax records.If they don’t accept your return as filed, they will explain any proposed changes to you and your authorized representative. It is important that you understand the reasons for any proposed changes; don’t hesitate to ask about anything that is unclear to you. Protection of Your Rights IRS employees will explain and protect your rights as a taxpayer throughout your contact with us. Privacy and Confidentiality. The IRS will not disclose to anyone the information you give us, except as authorized by law. You have the right to know why they are asking you for information, how they will use it, and what happens if you do not provide requested information.Ill. Professional and Courteous Service. If you believe that an IRS employee has not treated you in a professional, fair, and courteous manner, you should tell that employee supervisor. If the supervisor response is not satisfactory, you should write to the IRS Director for your Area or the Center where you file your return. Representation. You may either represent yourself or, with proper written authorization, have someone else represent you. Your representative must be a person allowed to practice before the IRS, such as an attorney, certified public accountant, or enrolled agent (a person enrolled to practice before the IRS). If you are in an interview and ask to consult such a person, then they must stop and reschedule the interview in most cases. You can have someone accompany you at an interview. You may make sound recordings of any meetings with our examination, appeal, or collection personnel, provided you tell us in writing 10 days before the meeting. Payment of Only the correct Amount of Tax. You are responsible for paying only the collect amount of tax due under the law-no more, no less. If you cannot pay all of your tax when it is due, you may be able to make monthly payments. Help with Unresolved Tax Problems. The Taxpayer Advocate Service can help you if you have tried unsuccessfully to resolve a problem with the IRS. Your local Taxpayer Advocate can offer you special help if you have a significant hardship as a result of a tax problem. For more information, call toll-free, 1-877-777-4778 (1-800-829-4059for 1TYffDD) or write to the Taxpayer Advocate at the IRS office that last contacted you. Appeals and Judicial Review. If you disagree with 1ls about the amount of your tax liability or certain collection actions, you have the right to ask the Appeals Office to review your case. You may also ask a court to review your case. Relief from Certain Penalties and Interest. The IRS will waive penalties when allowed bylaw if you can show you acted reasonably and in good faith or relied on the incorrect advice of an IRS employee. They will waive interest that is the result of certain errors or delays caused by an IRS employee. IRS accepts most taxpayers’ returns as filed. If they Inquire about your return or select it for examination, it does not suggest that you are dishonest the inquiry or examination may or may not result in more tax. IRS may close your case without change or you may receive a refund.The process of selecting a return for examination usually begins in one of two ways. One way is to use computer programs to identify returns that may have incorrect amounts. The programs may be based on information returns, such as Form 1099 or W-2, on studies of past examinations, or on certain Issues identified by other special projects. Another way is to use information from compliance projects that indicates a return may have incorrect amounts. These sources may include newspapers, public records, and individuals. If they determine the information is accurate and reliable, they may use it to select a return for examination. How Do You Appeal a Decision? Because people sometimes disagree on tax matters, the Service has an appeal system. Most differences can be settled within this system without going to court.Your reasons for disagreeing must come within the scope of tax laws, however. For example, you cannot appeal your case based only on moral, religious, political, constitutional, conscientious, or similar grounds.If you do not want to appeal your case within the IRS, you may take your case directly to tax court. You may appeal our tax decision to a local appeals office, which is separate and independent of the IRS Office taking the action you disagree with. An appeals office is the only level of appeal within the IRS. Conferences with Appeals Office personnel may be conducted in person, through correspondence, or by telephone with you or your authorized representativeIf you want to have a conference with an appeals officer, follow the Instructions in the letter you received. They will send your conference request letter to the appeals office to arrange for a conference at a convenient time and place.You or your qualified representative should be prepared to discuss all disputed issues at the conference. Most differences are settled at this level. Only attorneys, certified public accountants or enrolled agents are allowed to represent a taxpayer before Appeals. An unenrolled Preparer may be a witness at the conference, but not a representative.If you want to have a conference with an appeals officer, you may also need to file either a small case request or a formal written protest with the contact person named in the letter you receive. Whether you file a small case request or a formal written protest depends on several factors. Temporarily Delay the Collection Process. You can ask for relief no matter how small the liability. Three types of relief are available. If you filed a joint tax return, you are jointly and individually responsible for the tax and any interest or penalty due on the joint return, even if you later divorce. In some cases, a spouse may be relieved of the tax, interest, and penalties on a joint return. Equitable relief – applies to all joint filers.Innocent spouse relief and separation of liability apply only to items incorrectly reported on the return. If a spouse does not qualify for innocent spouse relief or separation of liability, the IRS may grant equitable relief.Each type of relief is different and each has different requirements. You must file Form 8857, Request for Innocent Spouse Relief, to request any of these methods of relief. Publication 971, Innocent Spouse Relief, explains each type of relief, who may qualify, and how to request relief.